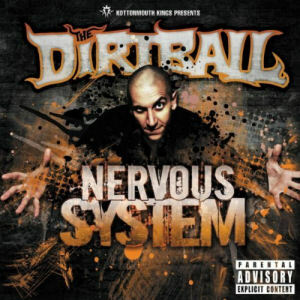 RapReviews.com Feature for February 22nd, 2011 - The Dirtball's "Nervous System"
Anybody wanna take a ride downtown? But he never woke up, now he laid to rest"
Enjoy life, it's a party parade"
The guests you would expect from the Suburban Noize family check in periodically for cameos, but it's beneficial they are kept to a minimum, since they somewhat outshine him when they do. Daddy X's performance on "Let's Do It" is more entertaining vocally and lyrically than his compadre despite giving Dirtball the first two verses. Big B shows up for one of the biggest beat songs on the album, "Karma Bite," a track which at least suggests Dirtball has a philosophical side beyond getting high. There's also a Psychopathic Records cameo courtesy of Blaze Ya Dead Homie on "The Paper," where he brags "My lungs are on fire/every breath is white ash/always gettin taxed for the split screens that I trash/in the studio/way before crack and Coolio/I was slangin dime bags out the front screen do'." BYDH has always sounded like the long lost cousin of Shaggy 2 Dope or Violent J, right down to his dusty clown growl vocally, and this track is no exception. The Dirtball is one of the artists who is hard to judge outside the context of the audience he is meant for. On that basis, anyone who likes the Kottonmouth Kings or who enjoyed any of his three previous solo albums would be perfectly happy with "Nervous System." Dirtball's speciality is definitely uptempo rip rock hip-hop party music, and most of these songs fit the bill perfectly. Some of them are even named for that very idea - "Bang Loud" would not work at anything other than top volume, "Move Back" is what you'd better do when people start moshing to the mayhem, and "No Cops" is exactly what you'd want if you were at said hot party. "Cops are not my friend/they won't let me win/I will not obey/nowadays, any crime pays." Does this album pay too? It certainly does for Dirtball's loyal fans. Occasionally I can lose myself in the music and the moment too, but a whole hour of partying and popping pills does get a little redundant. Still "Cracka Now" is funny and has a good West coast funk synth vibe, "Rule the World" is a refreshingly minimalistic exercise in lyricism, and "Long Road" shows Dirtball is capable of self-examination. There's more to this pill popper than meets the eye, but he's very careful to keep up the image he cultivated and not let it show.